When Curiosity lands on Mars, the radio receiver on Mars Express which will be listening in is Melacom. 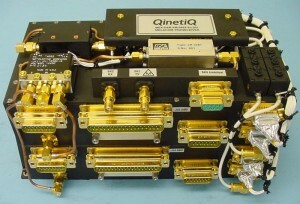 This radio was developed for Mars Express by the UK company, QinetiQ in order to support the Beagle-2 lander which was carried on Mars Express. Sadly the Beagle-2 lander failed to land successfully, but the Melacom lander communications package was not wasted and has been used to contact every single Mars lander to successfully land since the Mars Express launch in 2003. Mars Express has a large X-Band and S-Band radio system that lets it talk to Earth, but Melacom was specially designed as a separate UHF radio system to let it talk to landers on the surface of Mars. 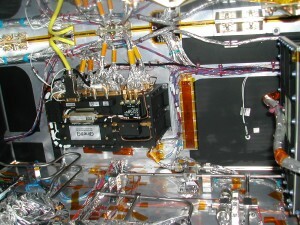 The radio supports a number of different modes, including the ability to hold a two-way data communication with a lander and the open loop mode we described earlier. It implements a standard known as Proximity-1, developed by CCSDS – an international committee that works on standards such as this to ensure that any spacecraft can talk to any other, such as the European Mars Express and the American Curiosity [more details on the excellent work done at CCSDS by ESA, NASA and other agencies here – Ed.]. Another shot of Melacom after installation on Mars Express, taken while the spacecraft was being built. The radio has been used successfully many times, including open loop recording of JPL’s Phoenix lander as it landed on Mars in 2008. In preparation for the arrival of Curiosity, our in-flight testing intensified and we’ve conducted a number of demonstration passes with NASA’s Opportunity Mars Exploration Rover, operated by JPL. During these passes we demonstrated the ability of spacecraft from two agencies to coordinate and work together at Mars, exchanging telemetry data and commands and conducting recordings. In anticipation of the arrival, a team from QinetiQ also took a test model of the Melacom radio to JPL to perform ground compatibility testing with a similar model of the Curiosity radio. Through all of these activities, we’re confident that we’ll all be speaking the same language at Mars when Curiosity arrives tomorrow. To learn a lot more in depth information about the Melacom radio and our support of the Curiosity mission using it, take a look at this conference paper by our Melacom engineer, Olivier Reboud.